Fernández-Pérez, R., C. Torres, S. Sanz, F. Ruiz-Larrea. 2010. Rapid molecular methods for enumeration and taxonomical identification of acetic acid bacteria responsible for submerged vinegar production. European Food Research and Technology (2010) DOI 10.1007/s00217-010-1331-6. Fernández-Pérez, R., C. Torres, S. Sanz, F. Ruiz-Larrea. 2010. Strain typing of acetic acid bacteria responsible for vinegar production by the submerged elaboration method. Food Microbiology 27(8):973-978 (2010), doi:10.1016/j.fm.2010.05.020. Navarro, N., B. Rojo-Bezares, Y. Sáenz, L. Díez, M. Zarazaga, F. Ruiz-Larrea and C. Torres. 2008. Comparative study of the pln locus of the quorum-sensing regulated bacteriocin-producing L. plantarum J51 strain. Int. J. Food Microbiol. 128(2): 390-394. López, I., C. Torres, and F. Ruiz-Larrea. 2008. Genetic typification by Pulsed Field Gel Electrophoresis (PFGE) and Randomly Amplified Polymorphic DNA (RAPD) of wild Lactobacillus plantarum and Oenococcus oeni wine strains. Eur. Food Res. Technol. 227:547–555. Rojo-Bezares, B., Y. Sáenz, L. Navarro, R. Jiménez-Díaz, M. Zarazaga, F. Ruiz-Larrea, and C. Torres. 2008. Characterization of a new organization of the plantaricin locus in the inducible bacteriocin-producing Lactobacillus plantarum J23 of grape must origin. Archives of Microbiology 189:491–499. López, I., R. López, P. Santamaría, C. Torres, and F. Ruiz-Larrea. 2008. Performance of malolactic fermentation by inoculation of selected Lactobacillus plantarum and Oenococcus oeni strains isolated from Rioja red wines. Vitis 47 (2): 123-129. Rojo-Bezares, B., Yolanda Saenz, Laura Navarro, Myriam Zarazaga, Fernanda Ruiz-Larrea, Carmen Torres. 2007. Coculture-inducible bacteriocin activity of Lactobacillus plantarum strain J23 isolated from grape must. Food Microbiol. 24(5):482-91. Rojo-Bezares, B., Y. Sáenz, M. Zarazaga, C. Torres and F. Ruiz-Larrea. 2007. Antimicrobial activity of nisin against Oenococcus oeni and other wine bacteria. Int. J. Food Microbiol. 116(1):32-6. 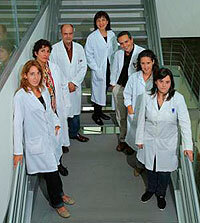 Hernández, T., I. Estrella, M. Pérez-Gordo, E.G-Alegría C. Tenorio, F. Ruiz-Larrea, M.V. Moreno-Arribas. 2007. Contribution of malolactic fermentation by Oenococcus oeni and Lactobacillus plantarum to the changes in the non-anthocyanin polyphenolic composition of red wine. Journal of Agricultural and Food Chemistry, 55(13); 5260-5266.